We are returning to the historic RAF Club in Piccadilly for our Annual Dinner on Friday 15th March with Dinner served at 7.30 p.m. in the elegant Presidents’ Room. As usual we cordially invite former pupils of the Royal High School, their partners and guests to gather from 6.30 p.m. for pre-dinner drinks and relaxed conversation in the adjoining Victoria Bar. Dress for the Dinner is formal with black tie, Highland attire or lounge suit all acceptable. We are delighted to announce that Royal High School former pupil David Robb will be our special Guest of Honour reflecting on his fifty years as a professional actor in conversation with Al Senter. David will recall some of the extraordinary people he has met in a career that has included blockbusters such as I, Claudius, Downton Abbey and Wolf Hall. Come along and enjoy a fascinating journey behind the scenes of some of Britain’s most memorable television dramas. The price of the excellent three-course dinner is £49 and demand for tickets is bound to be high. Make sure that you don’t miss out by sending a cheque to Alex Prentice, made payable to ‘The Royal High School Club in London’, using the reply slip below. An early response would be much appreciated to help us with planning the event. To reach the RAF Club, simply turn right out of Green Park Underground station (Jubilee, Piccadilly and Victoria lines) and walk down Piccadilly for four hundred metres in the direction of Hyde Park Corner. The RAF Club is at 128, Piccadilly just before the turning into Old Park Lane. We very much look forward to seeing you again on Friday 15th March. View full size on our Flickr pages. Following last year’s extremely enjoyable evening at the Iron Duke, we returned to this traditional Fuller’s pub in the heart of the West End for the Pre-Xmas Drinks Party. For further information on all aspects of the Annual Drinks Party, please contact Alex Prentice on Home: 01992 554854, Mobile: 07855 640570 or alex.prentice1@btinternet.com. The London Club sponsors the school’s ‘Prize For An English Poem’ at the annual prize-giving ceremony. The 2017 winner, Emma Sunter’s poem ‘I can’t think of not knowing you’ is published here. Those of you interested in the historical context may like to view the ‘Club Archives’ page under our ‘Gallery’ menu where a copy of a letter of 1888 proposing the first London Annual Dinner be held in spring 1889. Viewers of ‘The Crown’ may be interested to see newspaper photos of the young Queen Elizabeth’s visit to the school. 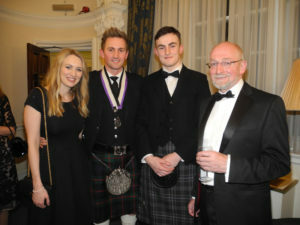 Royal High School Club in London welcomes former pupils and teachers of the Royal High School of Edinburgh, Scotland (RHS). Find out more about the club on our About page and our Past and Present page. Latest news of the club and events can usually be found in our News and Events blog before appearing on this page. Our website also contains many stories from former pupils and the odd former teacher. We also have a ‘Where are they now’ section where old school photos can be posted and hopefully former friends can be reunited. As well as the links at the top of the page, there are links in the footer which may also be useful. In particular, our Site Map provides an overview of the material available and should assist in finding your way around this site. Paul Fleming is our club president, having succeeded Fraser Wright in 2017. Read more about Paul. The committee ensure that the club runs smoothly. See who they are on the Committee page. 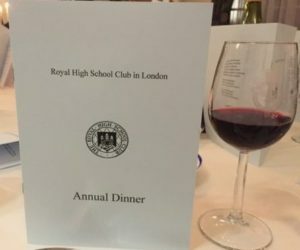 The Royal High School Club in London – Annual Dinner on Friday 15th March 2019. Bruce on Were you in the ATC? 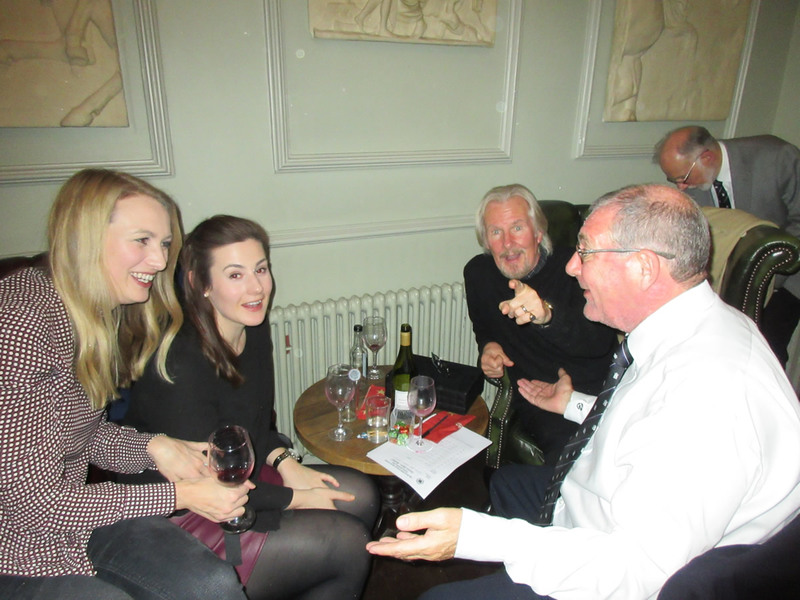 Our latest Pre-Xmas Drinks Party was held on Wednesday 21st November 2018. Photos from the event can be viewed on Flickr. Were you at the School in the Eighties? 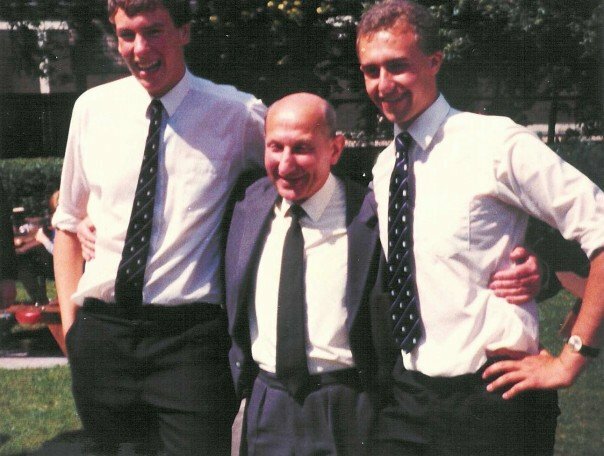 Following former English teacher, Tom Bacciarelli’s guest speaker appearance at the recent Annual Dinner in London, Callum Scott Brown has supplied an anecdote from 1984 and Fraser Wright has added some photographs of pupils and teachers from 1985. Photos from this event. Tap or mouse click the photo to see more details. 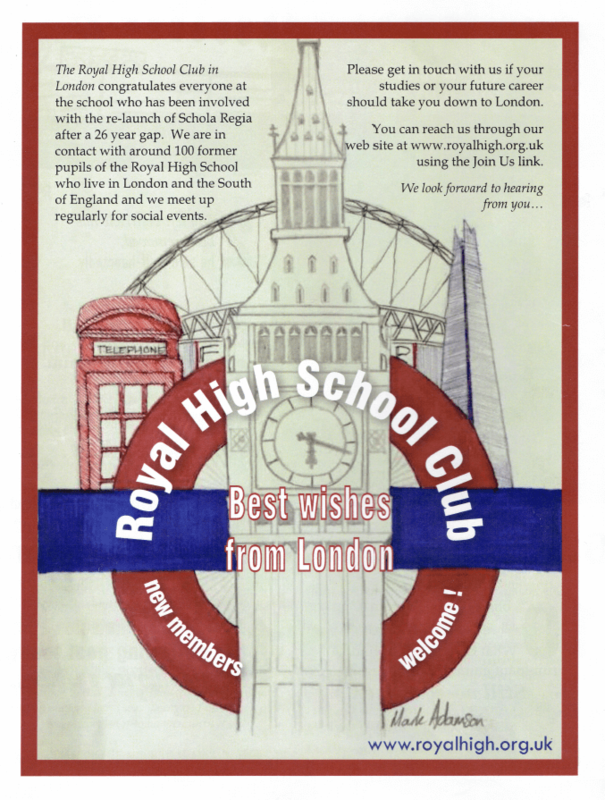 The re-launched school magazine 'Schola Regia' features a message of congratulations from the London Club on the back cover of the magazine. One of the school pupils, Mark Adamson, has produced this excellent art work to accompany our message. The following pages are now on “Where Are They Now”. Did you visit RAF Leconfield? Our 2017 Annual Dinner was held at the RAF Club in Piccadilly. This photo links to our Flickr website pages where more photos can be viewed. Were you in the ATC? © 2019 Typhina Web Development Limited.